This is a love story. This is a war story. One night in December a young couple, living in a quiet country village suddenly find themselves embroiled in a battle against an enemy that will threaten to rip their marriage, their family, their entire lives apart. Pneumococchal Septicaemia: it's like a panther, creeping quietly in the shadows, then pouncing and devouring: brutal; tearing limb from limb; efficient;total. It is a true story; told from two highly individual personal perspectives, including extracts from diaries written at the time. 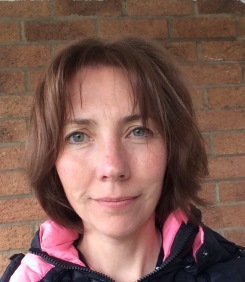 Nicola was 9 months pregnant with their second child at the time the disease struck and had the heart breaking task of giving birth in the same hospital where Tom was having surgery to revise amputations to his limbs. How do break that kind of news to a 2 and a half year old? How do you get her to visit the father she adores who looks like a monster? It’s about Tom’s childhood as well as his illness, showing how the challenges he faced plunged him into a fight to prevent a history of Paternal desertion repeating itself. The unique thing is that Tom has emerged from this experience able to tell his own story, with clarity and extreme self-knowledge. This is the story that inspired the 2016 feature film 'Starfish' featuring Tom Riley (Da Vinci's Demons, The Collection) as Tom and Joanne Froggatt (Golden Globe Winner, Downton Abbey) as Tom and Nic. 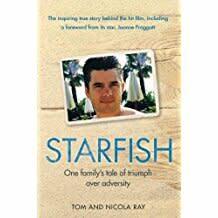 Tom and Nicola’s moving and inspirational memoir Starfish was serialised in the Daily Mail yesterday. John Blake have bought World English rights in Starfish by Tom and Nic Ray a powerful love story about the triumph of the human spirit against adversity. Tom Ray, an Exeter University graduate, was working in banking , with one young child and another on the way, when just before his fortieth birthday he was struck down by septicaemia. The result was the loss of his limbs and half his face. It is a moving account of how he rebuilt his life with the support of his wife against not just psychological and medical challenges but also financial hardship. The story inspired last year’s film ‘Starfish’ featuring Tom Riley (Da Vinci’s Demons, The Collection) as Tom and Joanne Froggatt (Golden Globe Winner, Downton Abbey)as Nic.